Keeping your diet on the right track is critical to achieving the best possible results after bariatric surgery. We've created this forum for sharing healthy recipes that will help you eat right and eat well. You're invited to add new recipes you discover elsewhere and enjoy. Bon appétit! Click on the recipe name to reveal the ingredients and directions. Melissa Majumdar, R.D., L.D.N., C.P.T. Coarsely chop the onion and add it to the food processor with the turkey, drained beans, seasoning, egg white, and garlic. Blend until ingredients are evenly distributed. Divide turkey into 10 patties. Grill 5 minutes each side. Finish them off in the oven for 8 minutes or until cooked through. Enjoy with green beans and low-fat potato salad. Consider using plain yogurt to substitute some of the mayo in your potato salad and mix up the potatoes with some sweet potatoes (leave the skins of for extra fiber if you are at least 3 months post-op!). Try mixing in dill, celery, peas, onion, mustard, hot sauce, and salt and pepper for a ton of flavor and very little extra fat. **Avocado is a great substitute for cheese. While cheese is high in saturated fat, avocado adds a ton of unsaturated fat – and flavor! Preheat oven to 450 degrees. Coat a baking sheet with non-stick spray or parchment paper. Form into breakfast sized patties and bake for 10 minutes. Freeze leftovers for a quick breakfast; patties can even be reheated without defrosting! Coat two pie dishes with non-stick spray. Divide mixture in between the dishes and bake at 350 degrees for 30 minutes. Serve with a nice salad on the side! The recipe makes a lot of sauce! You will only use 2 teaspoons in this recipe. Submitted by Nikki G.
Mix ingredients together. Set aside 2 teaspoons for the salmon and refrigerate the rest. Clean and season salmon. Spread sauce over the salmon and cook 15-20 minutes. **Overcooking the salmon will dry it out and make it harder to digest, so go easy on the cooking time. Dump everything into a pot and simmer until hot. Cook longer for stronger flavor. Serving ideas – top with low-fat grated cheese, plain Greek yogurt or sliced avocado. A quick weeknight meal or a healthy tailgating alternative. Heat a pot over medium to medium high heat. Add extra virgin olive oil, 3 turns of the pan, and the turkey meat. Season the meat with: chili powder, grill seasoning, cumin, Worcestershire and hot sauce. Break up the meat with the back of a wooden spoon into small crumbles. Chop the onion, reserving ¼ of it for topping the chili. Brown meat 5 minutes, then add onions and peppers and cook 10 minutes more. Add vegetable broth to deglaze the pan, scraping off the drippings. Add tomato and BBQ sauce and bring to a bubble. If using corn kernels or beans, add them now. Let chili simmer 10 minutes. Adjust seasonings and heat level to your taste. Remove from heat and serve. Serve with Greek strained yogurt, guacamole, low-fat shredded cheese, and veggies for dipping. Top with diced tomato or onion, cilantro, or sliced jalapeños (depending on your tolerance post-op). **Chop vegetables into small pieces and cook thoroughly during the early stages after surgery. If the small chunks are bothersome, feel free to leave them out. Place garlic into pan with olive oil and swish around until you smell it. Add chicken. Sauté for 5 minutes. Slice lemon or lime. Take a fork to get the juice and mix with the water. It is okay if some pulp gets into the water. Pour over the chicken and cover. Cook for eight to ten minutes; the water will cook down with the lime/lemon juice and will make a sauce. Serve over salad or brown rice. Wash and dry chicken. Season with taco seasoning. Cover chicken with diced tomatoes. Bake at 375 for 30-35 min. Remove from oven. Drain off excess liquid. Prepare noodles first, to allow to dry slightly before cooking. Place noodles in a strainer and thoroughly rinse with cool water. Place noodles in hot water for about 2 minutes. Drain and leave in strainer. Note: Remember that these noodles will still take up pouch room either though they have no carbohydrates, so if you are struggling to get in protein, skip the noodles! Cut broccoli crowns off stalks and then Julian cut carrots and broccoli stalk. Place broccoli and carrots in steamer and steam for 5 minutes. Prepare sauce: Juice the lemon and lime and mix with the other sauce ingredients until the peanut butter is smooth and mixed with other sauce ingredients well. Set aside. Julian cut mushroom heads, and 5 Spice Flavored Dry Tofu. Chop green onions. Thinly slice onion and then cut into quarters. Mince garlic cloves. Heat olive oil in pan on medium high heat and add minced garlic. Then add chopped onion. Once onions have turned translucent, add the slightly steamed broccoli and carrots, and then add in the mushrooms and tofu. Heat about 1 minute. Pour half the sauce over the vegetables in the pan and mix. Cook about 1 minute. Add the noodles and stir. Cook 1 minute. Add the remaining sauce. Cook another 2 minutes. Lastly, garnish with chopped green onion. Stir and serve. Slice the zucchini lengthwise into 1/8-inch thick strips. Place in a bowl and salt, tossing once or twice to coat well. Lay strips on paper towels on your work surface. Set aside. Saute ground turkey, drain, seasonings, tomato sauce, and mushrooms and simmer. Meanwhile, spray a large saucepan with nonstick spray and set over medium heat. Add the onion; cook, stirring often, until softened, about 2 minutes. Add garlic; cook 20 seconds. Blot any moisture from the zucchini strips. Squeeze dry spinach and mix with cottage cheese mixture. Spray a 9x13 baking pan with non-stick spray. Alternate layers of zucchini, tomato sauce, cottage cheese mixture, and mozzarella cheese starting with sauce. In a saucepan heat 1 teaspoon oil. Sauté ginger and garlic for 30 seconds. Add almond butter, vegetable broth, soy sauce, rice vinegar and chili flakes. Whisk together until smooth. On medium high heat, bring to a slight boil, and then reduce heat to low and simmer for 7 minutes. Set aside. While sauce is simmering, heat the 2 remaining teaspoons of olive oil in a large sauté pan or wok until hot. Stir fry sliced chicken until cooked through. Add bell peppers, onions, celery, and broccoli and stir fry on high heat until tender, about 3-5 minutes. Add mushrooms and saute for 1 minute. Remove from heat, add sauce to vegetables and toss until well coated. Serve over ½ cup quinoa or brown rice if more than 3 months post-op. Take a long piece of foil and spray the bottom with cooking spray. Lay fish on foil. Season with salt, white pepper, Creole seasoning, adobo seasoning and parsley flakes. You should season to taste. A dash of each should do. Don’t over-season because halibut is a delicate fish and you don’t want to take away from the flavors in the fish. Place onion on top of fish, then seal foil so steam stays in. Place foil on baking sheet. Cook for 25 minutes or until fish flakes. Mix in blender to remove clumps. Use as breads or wraps or simply enjoy as a breakfast treat! A high protein, whole grain side to add to a chicken or fish meal! Cook quinoa to packaged instruction (2:1 ration of water or broth to grain for 15 minutes or in a rice cooker). Preheat oven to 350 degrees. Coat 13x9 pan with non-stick spray. Whisk eggs and milk in a large bowl. Fold quinoa mixture and cheese. Stir very well and let some of the cheese melt. Transfer to prepared baking dish and bake 30-35 minutes until the top is browned. **Quinoa, pronounced "KEEN-wah," is a grain with nutritional properties similar to a seed. Therefore, it is high in fiber and protein. Quinoa can be light yellow or red in color and cooks just like a rice, but is done in 15 minutes. Look for it near the rice at your local grocery store or in the bulk department at health food stores. This recipe has lots of omega-3 fatty acids to keep your immune system strong and healthy. The thyme and paprika help improve blood flow and fight infection. The marinade keeps the fish moist, making it soft and easier to tolerate after bariatric surgery. Heat oven to 400 degrees. Mix orange juice, extra virgin olive oil and 1 teaspoon thyme in small bowl. Place char in large glass dish. Add marinade, turning fish to coat well. Cover and refrigerate 30 minutes or overnight for extra flavor and time-saving. Mix Splenda brown sugar, paprika, orange peel, the remaining thyme and sea salt in small bowl. Remove char from marinade. Place on greased foil lined in baking pan. Discard any remaining marinade. Rub top of char evenly with dry mixture. Roast char 10-12 minutes or until fish flakes easily with a fork. Makes 8-10 servings. This recipe is appropriate for two to three months post-op or 1 month post-op if the chopped vegetables are left out or cooked thoroughly. Combine salmon and hard-boiled egg in bowl. In another bowl, add chopped bell pepper, celery, onion and mayo. Add seasonings and stir to combine. Pour over salmon, add lemon juice, and toss lightly. ***Salmon is high in vitamin D, omega-3 heart healthy fatty acids and protein, and makes a quick and easy lunch. This recipe is great for the brain and helps balance your mood and appetite! One of Melissa’s favorite toppers for a low-sugar version on plain Greek yogurt. Coat the bottom of the pan with non-stick spray, add the sliced apples; I add a little water, cover and cook for about 10 minutes. Add brown sugar Splenda or other sweetener (make sure to check conversion factor), cinnamon, nutmeg if using, stir & cover, cook about 5 minutes. Save in the fridge to top Greek yogurt, cottage cheese or part-skim ricotta.Enjoy with a few crushed nuts on top and it will remind you of a fruit cobbler! Heat a large skillet over medium high heat. Add oil and meat to the pan. Spread the meat around the pan and begin to break it up. Combine brown sugar and steak seasoning. Add sugar and spice mixture to the skillet and combine. When the meat has browned, add onion and red peppers to the skillet. Reduce heat to medium and cook onions, peppers, red wine vinegar and Worcestershire sauce with meat for 5 minutes. Add tomato sauce and paste to pan. Stir to combine. Reduce heat to simmer and cook sloppy joe mixture 5 minutes longer. Serve with a few of your favorite multigrain crackers or half a whole wheat bun or English muffin. In a medium size bowl, mix the salmon, chopped onion, egg and spinach together. Add in a dash of salt, pepper, Creole seasoning, garlic powder, cilantro and chives: then mix. Pat into two patties. Heat pan and add 1 tablespoon of extra virgin olive oil. Cook patties until browned on each side. Remember that the salmon is already cooked; you’re just trying to cook your egg. After cooking, place on a paper towel to degrease: then serve. Cut squash into even circles. Season with a dash of salt and pepper and drizzle with 1 tablespoon of extra virgin olive oil. Mix in the slice of onion then add to heated pan. Toss mix in pan until squash starts to turn golden brown around the edges. Serve warm on a bed of mixed greens drizzled with balsamic vinegar. **Appropriate during and after pureed phase. Add one scoop chicken broth flavored or unflavored protein powder to increase protein. Combine all ingredients in large deep pot, simmer uncovered 2-3 hours or on high in a slow cooker. Puree (with immersion blender or cover the lid of your blender with a towel) if you are less than one month post-op. Mix tuna, cottage cheese and cucumbers: add salt/pepper. Chill. Serve on salad greens or with whole grain crackers. Enjoy! Add all the meatball ingredients in mixing bowl. Incorporate ingredients together with hands (use rubber gloves if you have them). Heat sauté pan, coat bottom with extra virgin olive oil. Brown meatballs, about 3-4 minutes each side. A moist chicken for the curry lovers. Adapted from Eating Well. Heat oil in a large skillet over medium-high heat and sauté garlic and onions until golden. Add chicken and sauté until browned. Add water, coriander, ginger, cumin, cardamom, and cayenne. Simmer uncovered until chicken is cooked, 15 to 20 minutes, stirring occasionally. The liquid will be mostly absorbed. Gradually stir yogurt into cornstarch until dissolved. Stir mixture into the pan. Simmer gently, stirring constantly, until the sauce thickens. Do not boil. Season with salt and pepper. Blend the berries, Greek yogurt, and Splenda until smooth. Pour into a ice cube tray, cover with foil. Poke a Popsicle stick or toothpick through the foil in each section of the ice cube tray. Freeze overnight. Enjoy! Cut eggs in half lengthwise. Scoop yolks into medium bowl and mash with a fork. Mix in mayonnaise and/or yogurt, tarragon, shallot, lemon juice, black pepper, and hot sauce. Mix in crab. Divide the crab mixture into 16 equal portions and spoon into the cavity of each half egg white. Tip: To hard-boil eggs, place eggs in to a medium-sized pot and cover with water. Place on the stove and bring to a boil, then turn off the heat and let the eggs sit in the hot water for 12-15 minutes. Refrigerate eggs until you’re ready to use them. Nutrition facts per serving (for recipe made with light mayonnaise): calories 130 (From fat 70): fat 8g (saturated 2g); cholesterol 240 mg; sodium 220mg; carbohydrates 2g (dietary fiber 0g); protein 12g; sugar 1g. Using a medium-sized pot, bring water to a boil. Once boiling, add the cauliflower florets to the boiling water, let cook for about 8 minutes or until the cauliflower is soft. Remove from heat and drain. Using a food processor, combine the cauliflower with Greek yogurt, olive oil, garlic and shallots until it is a creamy consistency. Add salt and pepper and blend again. Pour the mashed cauliflower into a bowl and stir in the Parmesan cheese while it is still hot. Sprinkle with the scallions and you are ready to enjoy! Mix all ingredients together, refrigerate for at least one hour. Can be used as a cold sauce for grilled meat or can be used as a marinade. Very tasty with chicken! Combine the avocado, garlic, scallions, basil, parsley, and tarragon into a food processor. Add the Greek yogurt, white wine vinegar, and lemon juice. Blend until smooth. Slowly add the extra-virgin olive oil and blend until well mixed. Enjoy over salad or grilled meat! Stir PB2 into Greek yogurt until smooth. Add jelly and enjoy! Hint: If Greek yogurt is too tangy or sour for you, feel free to add a sugar substitute such as Splenda or Stevia to sweeten it up for you. Slice the banana and freeze in a freezer-safe container. When completely frozen, blend the banana slices and PB2 until it becomes a nice smooth consistency similar to ice cream. Enjoy! Mix/blend all the ingredients together and pour over protein as marinade or use as salad dressing. This recipe will make about ¼ cup of marinade. In a large bowl, mix your meat, soup, spices and egg. The mixture should be work-able. If it is too wet add a few tablespoons of bread crumbs, but I seriously doubt that'd be a problem unless you use a really large egg. Lay out a large piece of plastic wrap on your counter. Place the giant "meatball" in the center of it and fold the plastic wrap over it. Using a rolling pin, roll your meat into a disc of whatever size you want. I used to roll it until the disc as about a 1/2 inch thick. Spray a cookie sheet or pizza baking sheet with nonstick and place your disc, plastic removed, onto it. Bake for 30 minutes. At this point the meat should be cooked through. Remove from the oven and top first with spaghetti sauce, then with cheese and toppings. Return it to the oven and bake it another 10-15 minutes or until the cheese is melted and cooked to your desire (I like my cheese a bit brown). Top with Parmesan cheese, red pepper flakes or whatever else you want to add. Season chicken with 1/4 tsp. each salt and black pepper and place in a crock pot. Top with apples and onion. In a medium bowl, thoroughly mix garlic into BBQ sauce. Pour sauce mixture over contents of the crock pot, and lightly stir. Turn crock pot to low (if needed). In a small bowl, stir to dissolve cornstarch in 1 tbsp. cold water. Stir mixture into the contents of the crock pot, along with remaining 1/2 tsp. salt. Let sit, uncovered, until slightly thickened, about 10 minutes. Stir and enjoy! In a small bowl, combine olive oil, garlic powder, onion powder, paprika, salt, cumin and dried thyme. Mix well, and with a brush apply spice mixture over tenderloin. In a medium saucepan, add tempeh, vegetable stock, and soy sauce. Cook for 10 minutes. Drain tempeh, reserving liquid from sauce. Add pineapple liquid to sauce. Heat oil in a skillet and sauté tempeh until lightly browned. Boil water in a medium pot; add green peppers and onions. Bring to a boil again, and drain. Put liquid from tempeh and pineapple juice into a measuring cup and add enough water to make 2 cups. Stir in soy sauce, arrowroot, and cider vinegar. Cook sauce until thickened and bubbly, them combine with peppers, onions, pineapple, and tempeh. Serve over quinoa or broccoli slaw for a nice crunch (a patient recommendation!). Recipe for Taco Pizza - Winner of the "New Protein Ideas" Recipe Contest! Recipe submitted by John B. Any other veggies you want to add, go right ahead! Pre heat oven to 350 degrees and either wrap a pizza pan or baking sheet with tin foil and spray it with non-stick cooking spray. Mix ground beef and egg in a large bowl. Then slowly add the taco seasoning till it becomes doughy. Start spreading out ground beef on the tin foil like a pizza. You want it about 1/4in. thick. Once you have it spread out place in the oven for 20-25 mins. After you take it out cut into it a bit to make sure it’s fully cooked. If it looks good use paper towels to wipe of all the extra taco seasoning and grease that has leaked out from cooking. Now add your refried beans and spread it out over you ground beef crust. Now add you salsa the same way. Now you add the cheese to the top. Put taco pizza back into the oven for 5 minutes or until cheese is melted. Add veggies, sour cream or yogurt, etc., and enjoy! *I cut my pizza into 10 slices. This gives me two slices a day for 5 days at work (my first and second breaks). Combine bread crumbs, 1Tbs Parmesan cheese, 3/4 tsp oregano, salt and pepper. 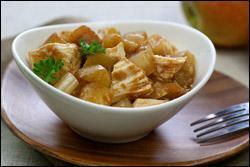 Slice tofu into 1/4 inch thick slices and place in a bowl of cold water. One at a time coat tofu slices with crumb mixture making sure to coat all sides. Spray the sides of the coated tofu with non-stick cooking spray. Place on baking sheet and bake 20-30 minutes until golden brown, turning halfway. Combine tomato sauce, basil, garlic and remaining oregano. Place a thin layer of sauce in an 8 inch square baking pan. Arrange tofu slices in the pan. Spoon the remaining sauce over tofu. Top with shredded mozzarella and remaining 3 Tbsp of Parmesan cheese. Bake at 400 degrees for 20 minutes. Serve over spaghetti squash or enjoy on its own! Season the chicken with salt and other seasonings; grill. Meanwhile, sauté the mushrooms and pepper rings in oil until slightly tender, but not mushy; set aside. 3. Spread the sauce over the chicken, then top with the pepperoni, the pepper rings, mushrooms and then finally, the cheese. Sprinkle with a little additional Italian seasoning, if desired. Bake at 350º about 10-15 minutes or until hot and the cheese is melted. Serve at once. Place all ingredients in a blender or food processor. Process until blended but not pureed. Transfer mixture to ovenproof serving dish. Bake, uncovered in 350 degree Fahrenheit oven about 30 minutes or until mixture is golden. In a pot, sauté onion, green pepper, tomato and celery. Crumble tofu and add to sauté. Add spices, tomato sauce and kidney beans. Cook for 1 hour (simmer) covered. Make sure to stir regularly. **Can also be made in a crock pot. Put up in the morning on low and enjoy the smell and taste when you get home from work 8 to 9 hours later. In a large sauté pan, brown beef and drai-n well. Set aside and add 1 Tbsp olive oil. Sauté onion, carrots, celery, green pepper and garlic until softened, around 5 minutes. Add tomato paste and sugar, stir to combine. Add water, lentils, cooked ground beef and bouillon cubes. Stir and add kale. Cover and simmer, stirring occasionally, until kale is softened and done, approximately 45 minutes. Taste for seasoning (S&P) and adjust. Enjoy! Preheat the oven to 325 degrees F. Spray an 8 by 8-inch baking dish or pie dish with cooking spray. Unwrap the spinach and put it, box and all, on a plate. Microwave and cook on high power for 4 minutes. Allow it to cool and remove it from the box. Squeeze out all of the liquid out of the spinach and put it into a medium bowl. Combine the eggs, yogurt, cottage cheese, Parmesan, flour, salt, and pepper, in a medium bowl. Stir together until the mixture is smooth, about 1 minute. Pour the mixture into the bowl with the spinach and artichoke. Add the feta and blend with a spoon until well mixed. Pour the spinach mixture into the baking dish and smooth out the top. Bake until set, about 45 minutes. Remove the baking dish from the oven. It will be puffed up, but will fall slightly as it cools. Allow it to cool, then, refrigerate. Cut it into squares or triangles and serve.